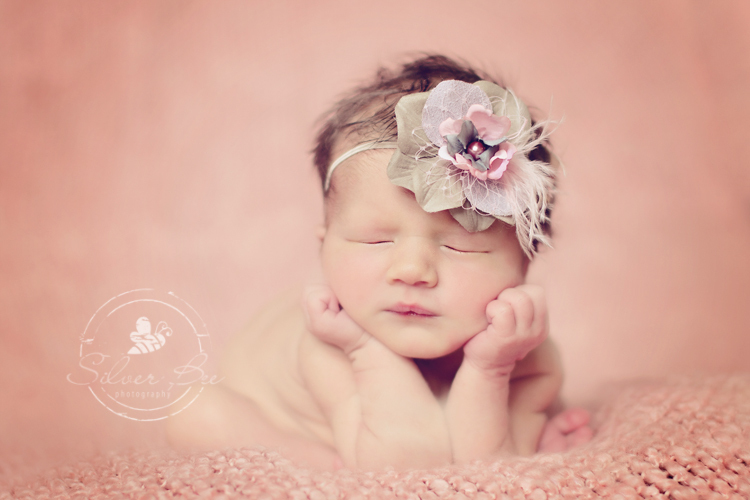 Oh geez, is this newborn baby girl adorable or what? She had the cutest expressions with her rumpled up forehead and she let me know she was not a huge fan of having her feet tucked, but we still conquered the shots! I photographed her cousin about a year ago, and the good baby gene must run in the family. She came to see me at a perfect time too, because I received lots of new prop goodies the day before! Her parents are equally gorgeous too, so I wasn’t surprised when she showed looking all cute with her tiny-ness. And oh, the hair! I have always been drawn to babies with lots of hair. My boys both had lots of it and it was the first thing we could see on the ultrasounds. 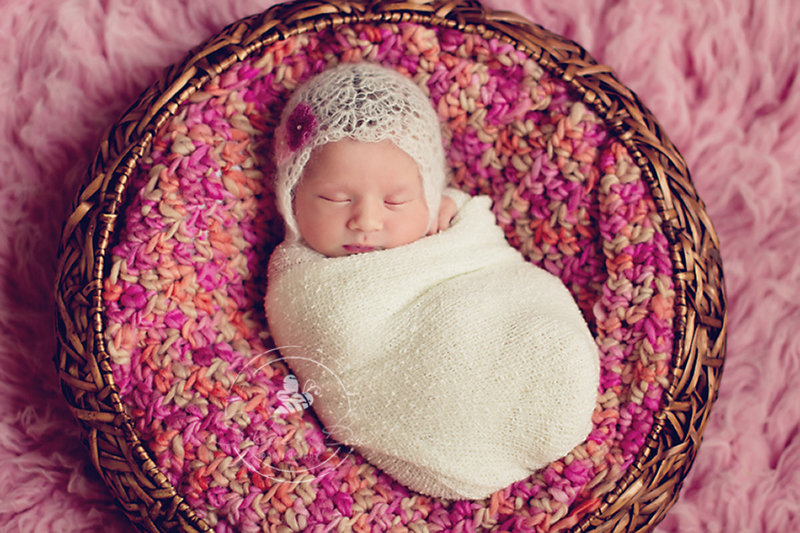 I do have to say it is lots of fun photographing baby girls. Being a mom of boys it feels like there is nothin’ but dirt and stink around here. So it is very exciting to have a little baby girl with that wonderful clean baby smell. Those smells that bring me back to when my guys were itty bitty. This little one arrived two weeks early, her mama went in for her checkup and told her that she was going to have a baby today! Kinda funny when you go to the doctor thinking you will be back at work in a couple of hours and to come out a mom to a beautiful baby girl. Guess that’s a great way to end the day. See what I mean about the rumpled up forehead. Love it! 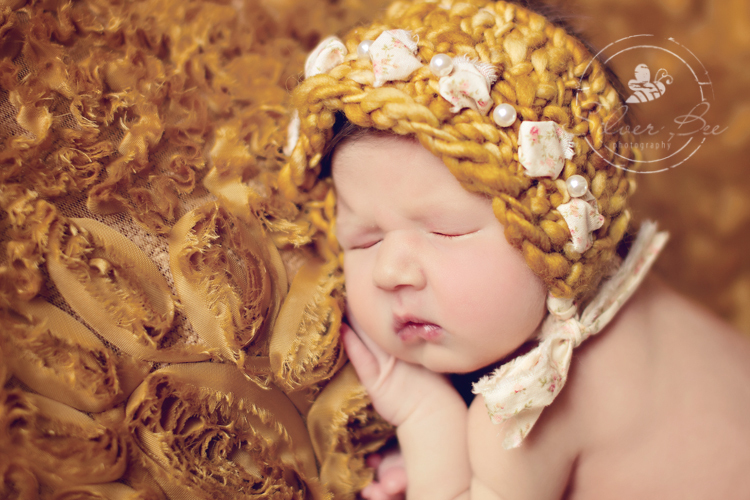 That’s my favorite thing about newborns is they dream and make all the sweet and funny faces. She had some good ones too! This little bonnet prop reminds me of Holly Hobby. Does anyone remember Holly Hobby? Every time I use it I think of that and when I was a little girl. Yay! She did it. Wasn’t sure we were going to get this pose but we worked all out!